Christine Grahame MSP at Leadburn Junction. 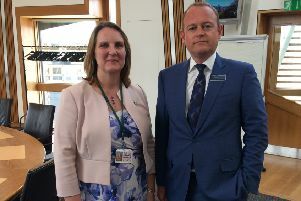 Local MSP Christine Grahame and Penicuik councillor Debbi McCall have called on the council to take action on Leadburn Junction following comments by David Mundell MP. The Secretary of State for Scotland said that he and his Conservative colleagues on Midlothian and Borders Councils would give full backing to the campaign to improve the notorious junction. Ms Grahame (SNP) said: “The Leadburn Junction has been a source of safety concern for local residents for many years. I’d welcome any action to improve it, but ultimately this falls at the feet of Midlothian Council. Council leader Derek Milligan (Lab) strongly denied that his party has any coalition with the Conservatives. A Midlothian Council spokesman said: “Leadburn junction is a rural junction, where two A class commuter routes cross. In the most recent three year period, to the end of October 2018, there have been two slight injury crashes and one serious injury crash. While accidents are not acceptable at any level, this is not significant when compared to other locations in Midlothian. Midlothian Council looks at accident clusters in April every year and prioritises work for the following year. “The worst of the last 10 years was 2013-14 with five injury accidents in 12 months, and a number of improvements have been made in the intervening period.